Jeanenne Longacre said she received a letter from Saxon Mortgage saying she was approved for a loan mod, but the final terms never came. She says she lost her home because of Saxon’s errors. Last week, the government released data  showing that there’s a big problem at Saxon Mortgage, a subsidiary of Morgan Stanley. Of all the mortgage companies participating in the administration’s mortgage modification program, Saxon has the largest proportion of homeowners caught in modification limbo. As of April, about 265,000 homeowners  were caught in trials that had lasted more than six months. Nowhere is that backlog worse than at Saxon, a mid-sized subprime servicer based in Texas that was acquired  by Morgan Stanley in 2006 and has had long-running customer service problems . Few of Saxon’s trials have converted into lasting modifications. As of the end of April, Saxon had put 40,000 homeowners into trials, but only about 11,000, or 27 percent, had received a permanent modification. Far more had either been dropped from the program (16,000) or were still waiting for a final answer after being in the trial for longer than six months (10,000). A close look at Saxon provides a window into problems with the program itself, in particular a glaring lack of oversight from Washington. While the government set up the program, it relies on mortgage companies to actually perform modifications. So far Washington has shied away from penalizing those servicers that have failed to follow the program’s rules or underperformed. Indeed, despite widespread problems  among mortgage servicers and frequent tough talk  from Treasury officials, who have often threatened penalties, the government has yet to issue a single one. For homeowners, on the other hand, the consequences of servicer problems can be all-too-real. Some homeowners say they lost their home because of errors by Saxon. The country’s largest mortgage servicers are attached to the biggest banks like Bank of America, JPMorgan Chase and Wells Fargo, but a number of mid-sized servicers like Saxon are stand-alone companies or subsidiaries of other banks. As of 2008, Saxon serviced over 340,000 loans. According to the Better Business Bureau, Saxon Mortgage Services requests that consumers with a complaint contact Robin Chrostowski, Assistant Vice President of the Customer Solutions and Innovation Team, at 817-665-7862 or email CSIteam@saxonmsi.com to resolve the issues prior to filing a complaint with the Better Business Bureau. The company already had problems before the administration launched its mortgage modification program in April 2009. As the Wall Street Journal reported last July , Saxon ranked last among 20 servicers in a Credit Suisse analysis of how many subprime loans each had modified. The Better Business Bureau had given the company an “F”  rating, based on a profusion of consumer complaints. But the company was among the first to sign up for the government program when it launched in April, 2009. In the first few months, Saxon put tens of thousands of homeowners into trial modifications. In a November press release, Saxon CEO Anthony Meola boasted  that Saxon was leading all other servicers in the number of trials it had begun. The Treasury Department had set the rules of the program  to encourage servicers to rapidly enroll homeowners. Servicers were allowed to accept homeowners on the basis of their “stated” income, what a Treasury official described  as “a wing and a prayer.” The financial information would be verified later, after the trial began. While well-intentioned, the policy resulted in an enormous backlog of trials—homeowners who had been given temporary modifications and were waiting months for a final answer — and Treasury changed the program rules this spring to require verified income information up front. Consumer advocates say that homeowners who are denied modification after making several months of trial payments are often worse off than if they’d never started the trial at all , because the process damages their credit and they’re prevented from saving for the possibility of foreclosure. At Saxon, many homeowners seem to be caught in that limbo because of mistakes and delays at the company. John Riggins, the CEO of the Fort Worth Better Business Bureau, said that the biggest complaints about Saxon are that the company has misapplied payments or lost documents sent as part of the modification process. Saxon employees often blame computer problems or a lack of staffing, according to the complaints, which number 208 in the past year. Saxon has hired about 330 new full-time employees in the past year, she said, increasing the staff by 50 percent. Riggins of the Better Business Bureau said that the complaint volume had improved since last year, but that major problems remained. Saxon has improved only from an “F” to a “D-.” rating . There are other signs Saxon has been struggling to handle the volume. In April, it transferred the servicing rights  for about 38,000 loans to Ocwen, which specializes in servicing troubled loans. “Normally the reason for selling loans to Ocwen is you don’t want to hassle with them anymore and they’re delinquent,” said Guy Cecala, the publisher of Inside Mortgage Finance. Some of the loans transferred were in the middle of the modification process. Sometimes the communications from Saxon can be bewildering. Barbara Niederstein of Fayetteville, Ga., said she has twice received letters saying she was being dropped from the program. Both letters cited missing documentation as a reason, but she says she was never told it was missing. Saxon has threatened to pursue foreclosure. Niederstein says that hours spent on the phone with a housing counselor and Saxon employees has at least postponed that for a month, even if the confusion has yet to be cleared up. 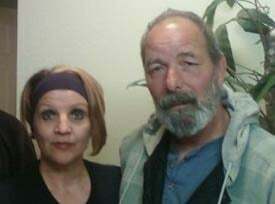 Jeanenne Longacre and her husband Robert. Jeanenne Longacre says she lost her home because of Saxon’s errors. She says Saxon wrongly set the trial payments at a level Longacre and her husband could only muster for a few months, and then booted her from the program when she couldn’t keep up the payments. Her house was ultimately sold out from under her after she says she received an assurance the sale would be delayed. For months, her husband had been struggling to find steady employment when Longacre lost her job with California Blue Cross in February 2009. They were behind on their mortgage payments and faced foreclosure. The pair, in their 50s with grown children, had been in the house for 10 years, but had refinanced in 2006 into an adjustable-rate loan with New Century, the now-defunct subprime lender. The Longacres were underwater on their mortgage, with their Los Angeles home worth about half as much as they owed. Longacre says Saxon’s first error with her modification came with the level of the couple’s payments. The modified mortgage payment was set at $3,400, about $1,400 lower than the couple’s payments had been, but at a level they could maintain only with the help of temporary severance she was receiving. That severance would run out in August, just two months after her trial began in June. Sala, the spokeswoman for Saxon, said she could not discuss Longacre’s case because company policy prohibited discussing customer information. Still, Longacre kept paying. After August, the third month of the trial, came and went with no news, Longacre began calling Saxon regularly to find out what was happening. For months, she says she couldn’t get an answer. She was occasionally asked to send in a new document, but then the wait would continue. Finally, she spoke to a negotiator in January this year, the eighth month of her trial. He told her she’d be approved for a permanent modification and that the payment, based on her family’s verified income, would be much lower, just $1,300 a month. But her excitement was short-lived. She received a letter from Saxon in early February  saying she’d been approved for the modification, but the final terms never came. When she called to ask about that, she says she was told she had to make the trial payments for January and February or she’d face foreclosure. The couple had missed those payments because their money had finally run out, she says. But even though Saxon had set their permanent modification at a level far below her trial payments, she was dropped from the program for not making all of her trial payments. In March, she received a notice that Saxon would auction her home on April 1. She hired a lawyer to negotiate on her behalf, and it seemed like foreclosure had been temporarily avoided when a Saxon employee said the sale would be postponed until May in order to provide more time to work out another solution. Longacre thought the auction had been deferred until a man knocked on her door in early April, saying that he represented the new owners of her home and was offering her money to vacate. The home had sold for $302,000, less than half of what the Longacres owed on the mortgage. “That home was the only thing we had. I put it everything that I own into that home.” She currently lives in an apartment with her husband. As we reported earlier this month, mistaken foreclosures can result from a lack of communication within the servicer itself . In Longacre’s case, she says she was not provided a denial letter or given an opportunity to otherwise avoid foreclosure, as the federal program’s guidelines require. Consumers advocates say the program does not offer an effective recourse for homeowners to redress servicer wrongs. 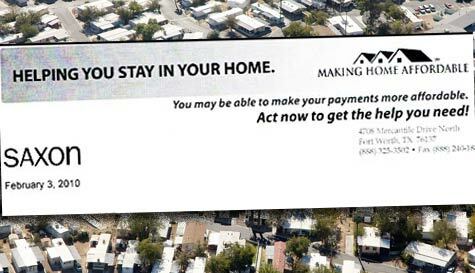 Treasury officials say  that homeowners in Longacre’s position should call the HOPE Hotline, which is staffed with housing counselors, for help. Advocates say that’s been ineffective, and have long complained  about the lack of a formal appeals process for homeowners. Longacre’s case also reflects on a problem faced by the hundreds of thousands of homeowners who’ve been caught in prolonged trials: whether they must keep paying after the three-month period expires, and whether mortgage companies can deny modifications if homeowners miss payments while they’re in limbo. The Treasury Department has given conflicting answers for that question. Four other Saxon customers told ProPublica that they’d been disqualified for missing the extended trial payments. Sala, Saxon’s spokeswoman, said the company follows the program’s guidelines. It’s unclear if there will be any consequences for Saxon for any errors or rule violations. The Treasury has hired  Freddie Mac  to audit the servicers participating in the program, and so far, as Saxon’s spokeswoman has said, auditors have not flagged any “material issues” at the company. The Treasury spokeswoman said some information from the compliance reviews will eventually be made public, but none was available now.